Guest house with country setting yet close to town available for rent. 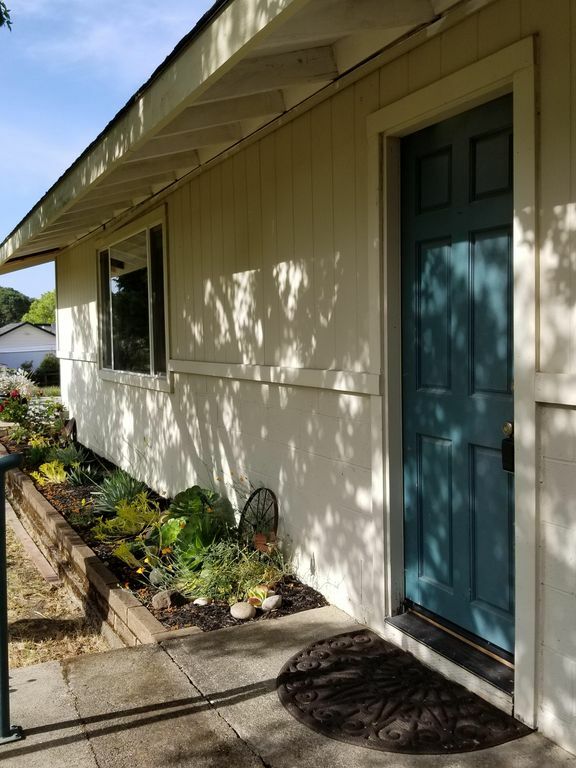 Newly remodeled, fully furnished guest house in Napa. Rare and great opportunity for monthly stays in wine country. Only a 5 minute drive to downtown. Views of open land and mature oaks provide a country setting close to town. Located on an acre near a state park. Large detached main house is nearby but still offers privacy to guests. Owners are easily available via phone, email or text and happy to assist in any way. The unit offers fully equipped separate kitchen with seating for 4. Newly remodeled full bath has lots of storage. Stacked washer and dryer located indoors provided. Queen bed and queen sleeper sofa provided. The area around the property has occasional visiting wildlife. Small pets are considered for an additional fee. Hiking, mountain biking, frisbee golf course and seasonal archery field are all located next to the property. House is located 3 miles south east from downtown Napa. Uber and Lyft is popular and available if needed. Napa wine train and Oxbow Market are located 3 miles away. Unit is good for couples, solo adventurers and business travelers. Small families are welcome. RV parking is available with guest house rental at an additional daily charge. ( No hook ups available). New heating and air conditioning unit recently installed. There is a small backyard patio with outdoor seating and BBQ. PLEASE NOTE: The house is up 2 short flights of steps. Handrails are in place. Entire guest house is on one level. The unit accommodates sleeping for 4 which includes a sleeper sofa located in same area as the queen bed. (Studio style). Both my husband and I grew up in Napa. We live in Napa and have several family members that live nearby. Our guest house is available for rent and is also used on some occasions by our out of town family and friends. The main house on the property is occupied on occasion by our immediate family. The property is in a location that provides quiet and privacy yet close to town. Our property is unique because it provides plenty of parking next to the house. Also, we're located next to outdoor activities and RV parking is available here on the property. Having RV parking available provides the opportunity of having another couple sleep near the guest house. Owners are available via text, email and phone. - 1 bedroom (Open to TV/couch area). Sleeps four with memory foam sleeper sofa. - Fully furnished with almost fully equipped kitchen (no dishwasher). - Outdoor patio with table and four chairs (more chairs available). - Outdoor BBQ available. - Flat screen TV and wireless internet provided. - Washer and dryer provided in guest house. - Heating and air conditioning with remote control. - All linens provided. - On property car parking is free. RV and boat parking is available for a daily extra charge. Walk in shower newly remodeled. Rural feel but very close to downtown. heating and air conditioning provided in the home. Heating provided in the home and the bathroom. Linens provided for the queen size bed and the queen size sleeper sofa. Washing machine and dryer provided in the home. Parking provided in front of the home. WiFi internet is located in the house. Gas stove and oven are in the kitchen. Microwave is located above gas stovetop. Coffee and coffee maker are in the kitchen. Toaster is located in the kitchen. Full kitchen with utensils and cookware are in the kitchen. Full kitchen, but no dishwasher. Bistro height table with chairs are in the kitchen. Television is provided and mounted on the wall. Satellite dish network provided for the television. Cards and card games are provided. We were looking for a place to unwind. What we found, in this wonderful property, was a place to get refreshed and renewed. The cottage was even better than advertised and we could not have been more pleased...the amenities were first class! The owners respected our privacy, were extremely hospitable and made us feel welcome. I would recommend this property without reservation...it was fantastic! Rural feel but close to downtown. Uber and Lyft are available all over the valley with minimal wait time.